One of the biggest complaints often levied at wireless gaming mice is that they’re simply too slow and heavy compared to their wired rivals. Despite being free of snagging cables that somehow manage to get in the way of everything at all times, that liberty often comes at the cost of latency and reliability, with the extra disadvantage that they’ve now got to carry a battery round as well as all their various bits of wireless gubbins. Strides have been made to rectify these challenges, of course. Razer’s Mamba + Firefly Hyperflux combo managed to get round the latter problem with its featherlight 96g wireless mouse that magically charged itself just by sitting on its mouse mat, but it also cost an arm and a leg. 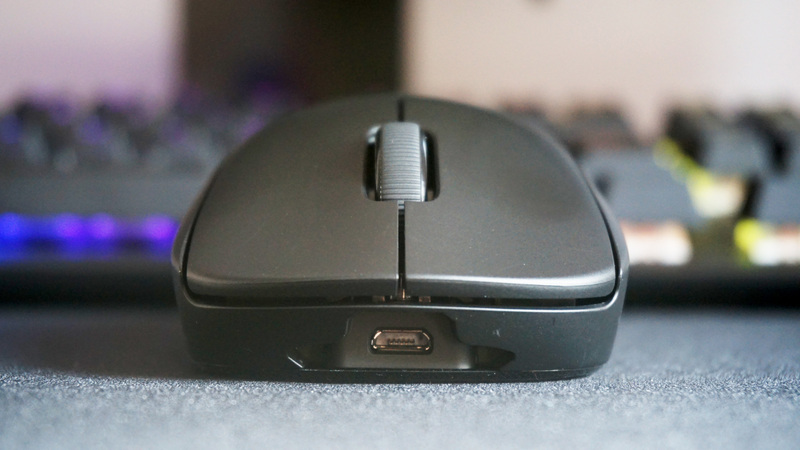 The ambidextrous Logitech G Pro Wireless on test today, however, goes several steps further – it not only weighs an almost impossibly light 80g, but Logitech’s Lightspeed Wireless tech claims it has a lag-free, 1ms report rate connection. And it’s quite possibly the best gaming mouse I’ve ever used. A lot of the Pro Wireless’ key ingredients aren’t actually that new. The Lightspeed tech is the same stuff you’ll find in Logitech’s G903 and G603 wireless gaming mice, both of which our Alec enjoyed very much (minus the G603’s razor sharp finger spikes, that is) as well as the G305 and G703. 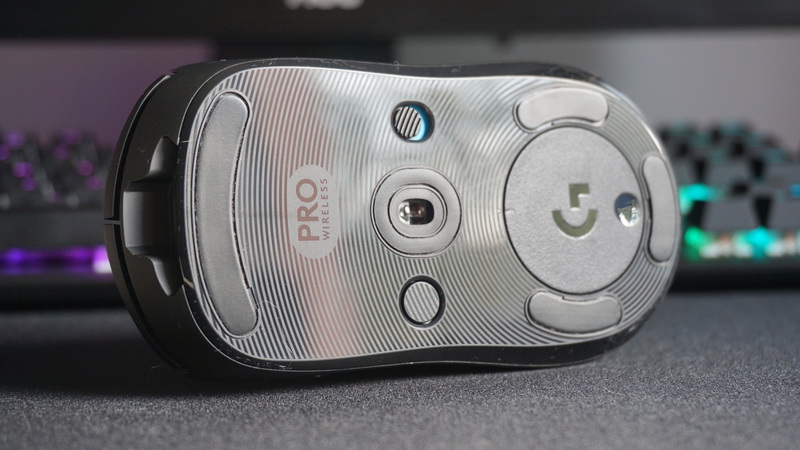 The Pro Wireless also has the same Hero 16K sensor as the excellent G502 Hero, too, so it’s not like you’re getting a mouse that’s any faster or has a higher sensitivity range than Logitech’s £80 / $80 wired job. However, when you put those two things inside a mouse that weighs just 80g, it transforms the Pro Wireless into an absolute revelation. It’s just so light and wonderfully agile, and I decided almost immediately that I never wanted to go back to using a wired mouse ever again. It was so fast and easy to use, in fact, that I often forgot I was using a wireless mouse altogether. To me, it was like it had been wired into my PC all along, which isn’t something I can say for the Razer Mamba. Indeed, Logitech claim their 1ms click response time is actually faster than what you get on some of its wired competitors, but unless you can tell the difference between 1ms and 5-10ms (which I certainly can’t), the actual number is neither here nor there. The important thing is how responsive it actually feels, and from my experience you’re essentially getting wired-levels of speed and responsiveness without the hassle of all those pesky cables to deal with – which, in my books, is a definite plus. However, just because the Pro Wireless weighs practically nothing doesn’t mean Logitech have skimped on build quality. Its thin outer shell feels smooth and robust to the touch and, more importantly, doesn’t have a single trace of belonging to that rubbo school of so-called ‘gamer’ design. 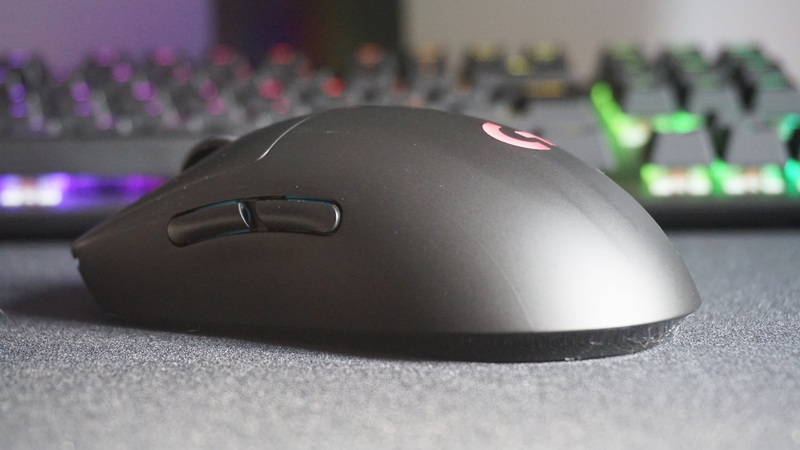 Logitech may well be pushing it as an elite esportsing mouse, but thankfully they’ve kept it all nice and simple so the rest of us needn’t be embarrassed about having one on our desks for regular PC duties. Of course, you’ll probably have noticed the distinct lack of a DPI / sensitivity button below the scroll wheel on the Pro Wireless (it is, in fact, located beneath the mouse for some strange reason, making it pretty much next to useless), but you do get a pair of buttons on either side to make up for it. All were within easy reach of my various fingers – although you’d probably have to have the nimble dexterity of a concert pianist to use the ones next to your little finger with any degree of regularity – but you can always pry them off with your nail and swap it for one of its bundled button caps instead to prevent any unwanted clickage. Whatever combo you decide to go for, though, each button bar the unreachable DPI one (including the scroll wheel and right and left click) can be configured to perform all sorts of different functions using Logitech’s flexible Gaming Software tool. These range from a multitude of DPI options that cycle up and down or shift to whatever the lowest setting is for as long as you hold the button down (handy if you like having more control over your mouse when trailing enemies down the end of a sniper sights, for example), regular mouse functions, media controls, customisable keyboard shortcuts and recordable multi-key macros. For some reason, Logitech took the bizarre decision to put the DPI button beneath the mouse next to the power button. If you’re travelling, you can also pop out the round G compartment and stick the USB receiver inside it for safe-keeping. You can also use Logitech’s Gaming Software to assign up to five DPI speeds anywhere between 100 to 16000, as well as configure five different profiles and adjust the Pro Wireless’ RGB lighting on its discreet G logo. Helpfully, Logitech’s Gaming Software also tells you precisely how much power each lighting setting uses, giving you a useful overview of how it will impact the mouse’s overall battery life and how much you can save by opting for something else. Speaking of battery life, the Pro Wireless is rated for up to 60 hours with no lighting enabled, and up to 48 hours on its default colour cycling profile. The latter doesn’t quite match what’s possible on Razer’s latest incarnation of the Mamba, which claims a 50 hour battery life when it’s not paired with one of its self-charging mats, but it’s still a heck of an improvement on the 24-32 hours you’ll get from Logitech’s own G903 and G703, as well as the new Steelseries Rival 650 Wireless’ 10 hours. Logitech’s G603 still has the edge on all of those, of course, with its 500 hour performance-based battery life and 18-month ‘endurance’ mode, but I reckon the Pro Wireless’ battery life is still pretty decent as far as most of its main competition goes. At most, you’re probably looking at charging it once a week if you’re using it 8 hours a day for regular work tasks, but less frequent gaming spells will probably put that figure closer to once a fortnight or even once a month. You will have to plug it in via its bundled USB cable in order to charge it, but I reckon that’s a small price to pay for such a lovely, responsive-feeling mouse. The Pro Wireless has a pretty decent battery life, but you’ll need to plug it in via USB in order to recharge it. I’m also pleased to see that Logitech have gone for a proper scroll wheel this time, and not the endlessly spinning monstrosity they had on the G502 Hero. Not only does this one’s scroll motion feel nice and taut, but it’s also virtually silent, which is an absolute godsend after the Hero’s CLICK CLICK CLICK stopper doodad. Sadly, such perfection doesn’t exactly come cheap, as the Logitech G Pro Wireless will set you back a princely sum of £130 / $150. Still, as expensive as the Pro Wireless is, I’d say it’s absolutely worth it in this case, particularly if you’re tired of tripping over wires and wish your PC setup was a bit simpler. It’s hands down the best gaming mouse I’ve ever used, wireless or otherwise, and its smooth, comfy, gamer-free design makes it perfectly suited to both gaming and desktop duty alike. Its battery life is also right up there with the very best, and while it may not have the magic charging capabilities of Logitech’s G903, you’ll feel a lot less silly having one of these on your desk than its pointy-angled sibling. It’s my new wireless gaming mouse champion. Tagged with feature, Hardware, Logitech, mice, mouse.